Do you remember the very first time you ever rode a bicycle by yourself, if ever you did? Do you remember that feeling of excitement mixed with an equal sense of foreboding as you pedalled that first, short, wobbly distance? The excitement was in doing something you had never done before; the foreboding was in the almost certain knowledge that sooner rather than later your sense of balance would desert you and you would fall off your bike. The next frightening moment was when you learned to signal which meant having to take one hand off the handlebars with the further wobbles and the tumbles that that may have involved. But as your technique improved every time you rode your bike you could think back to the bruised and bloodied knees of those early days and know that it had been worth it. When Jesus appeared to his disciples after his rising from the dead, they were overjoyed to see him and yet they could not help but notice that he still carried the wounds he suffered at his crucifixion. They saw the marks of the nails and spear in his hands and side and most of them would have remembered how they had abandoned him at the time when he needed them most. But he did not blame or scold them, he wished them peace. What was done was done and he wanted them to have peace of mind and concentrate on the future. His wounds would remain an eternal sign of the cost of love and they would learn that in good measure. From the moment we were born, life has been a constant learning process. Over the years we have all had opportunities to learn new skills. When we attempt something that is unfamiliar or complicated we have to make allowances for the mistakes we shall make in the process. If we are seriously committed to what we have begun, we may have to allow ourselves some extra time and patience until, gradually, we are able to move forwards from ‘beginner’ to ‘proficient’ and maybe even to ‘expert’ status. The strange thing is that we do not always make allowances for ourselves or for others as we learn the biggest and most important lesson that will ever challenge us: how to live as a fallible human being in a world that is itself far from perfect. We have a lifelong path of discovery to take if we are to be rewarded with a quality of goodness at the heart of us. Everybody stumbles and falls on the way, so it is important that we should not feel discouraged and give up the effort. God knows that we are learners in life. He sees the ‘L’ plates which are invisible to us and to others. He makes excuses for us when we fall far short of perfection and asks just one thing of us: that we ‘try, try and try again’. At Pentecost Jesus again tells us to be at peace, however battered and bruised we may feel. We are still learning to be like him and God makes allowances for that by sending us the Spirit of love and encouragement to help us make a fresh start at all those times when that is just what we need. This new giving scheme has now been introduced in all the churches in our Team Ministry. Although for many of us giving through the bank by direct debit rather than putting an envelope in the collection plate is a new idea, on behalf of the Churchwardens and PCC, I wish to commend this scheme to you and to endorse it wholeheartedly. I can not emphasise enough how important it is that we all make time to prayerfully consider our giving to God and switching to this new giving scheme. If you have not received an information pack, please ask; there are supplies in both churches. Also, please do feel able to ask to discuss this scheme with someone: the PCC treasurer, Churchwardens or clergy would be happy to do so. May I take this opportunity to thank those who have already signed up to the new scheme and also to express thanks to all of you who support God’s work in this part of His kingdom through your financial gifts. Over the next nine months or so I will be taking part in the Anglican Communion’s ‘Indaba’ Project. The idea is that a group of eight people from each of three Dioceses (including a bishop, clergy and lay people) will meet all together in each Diocese for about a week each time. During that time we will pray, worship, study the bible, experience the church’s mission in that context and discuss key issues. The four issues which have been identified for our discussions are: deepening the unity of the church; creating a multi-generational church proclaiming the gospel within our contemporary culture; resourcing and sustaining mission and exploring how to combat poverty. We will be meeting in the Diocese of Western Tanganyika, Tanzania (June 2011) and then El Camino Real, California (November 2011) with the return leg in Gloucester Diocese in February 2012. ‘Indaba’ is a word taken from Zulu culture: it is a community gathering together to listen to each other’s points of view. Facing big disagreements within the Anglican communion over issues such as sexuality and female priests and bishops and, underlying these, the different approaches to relating to the Bible and culture, it was recognised that the old approach of ‘I’m right, you’re wrong’ debating was not going to help unity and direction. I hope it will not be about putting on a show for each other – although hospitality will be an important part. The emphasis is on honestly exploring the context and response to that in which the church engages in God’s mission. It is certainly not about giving each other the answers – but developing trust and broadening our awareness of God’s world and how he is using others in His mission. 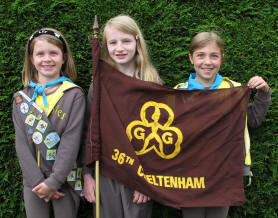 When we met together as a group from Gloucester Diocese there was a real mixture of excitement and nervousness. We all felt that it would also be a transformative experience for us – but very aware that it would probably be in unexpected ways as we serve a God of surprises. Please pray for Bishop Michael, Robert Springett, Jacqueline Rodwell, Debbie Forman, Paul Williams, Anne Davies, Rosie Woodall and myself as we prepare for and travel out to Tanzania. Liz Palin will be ordained deacon in Gloucester Cathedral on Sunday 3rd July at 10.15am. If you would like to attend the service, please give your name to one of the Churchwardens. Liz will be ordained to serve in the North Cheltenham Team Ministry but will also be continuing in her full-time role as Director of Glenfall House, the Diocesan Retreat and Conference Centre in Charlton Kings. Many of you know Liz already as she and her husband Simon have been worshipping in Prestbury, mainly at St Mary’s. To celebrate Liz’s ordination we are all invited to an ‘open house’ at Glenfall from 3pm on Sunday 3rd July (but please put your name on one of the sign-up sheets in church before 5th June). This will be a good opportunity to meet Liz and her family and to formally welcome her to our Team Ministry and to sharing in God’s work with us here. 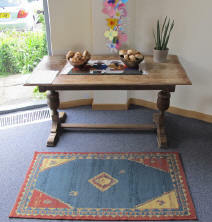 Tea will be provided at Glenfall House and transport is also available; please ask one of the Churchwardens. Please do put your name on one of the sign-up sheets to indicate that you will be attending. The Revd Julia Hook will be ordained priest during a service in Gloucester Cathedral on Saturday 2nd July at 4.30pm. Anyone is very welcome to attend and we send Julia our love and prayers as she comes to this new stage in her ministry. Sunday 12th June will be my first visit to St Mary’s as I am starting a placement with you until Christmas to help me as I explore the possibility of ordination. I am currently a member of St Michael’s where I am part of the Local Ministry Team and my husband Deryk is a Churchwarden. We have lived in Cheltenham all our married life and have two adult sons. I am looking forward to coming to Prestbury and sharing in the life of your church for a few months. Seventeen Members attended the Annual meeting on the 15th April with ten apologies. Our Treasurer Margaret Waker gave her report and stated that our finances at the end of 2010 are in the same position as 2009. Generally the donations to flowers are down but weddings donations are up. 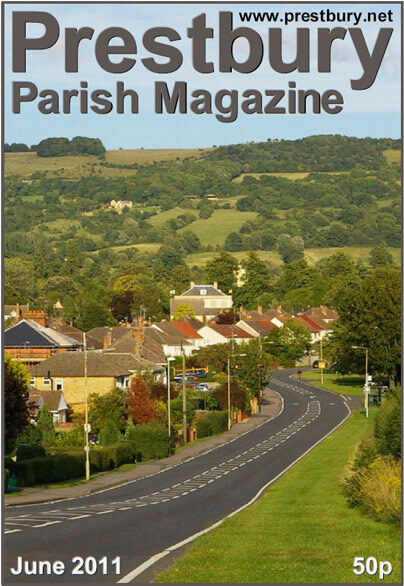 In the May Parish Magazine Wendy Price brought readers’ attention to the problem of funding and whether donations might be considered for the flowers at all festival times. 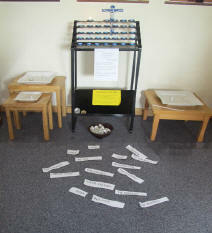 A demonstration in the church in January, by Ron Middleton, of a pedestal and a windowsill arrangement was very successful. This was organised by Sue Fairclough and both she and Ron were thanked for this. This demonstration was to encourage ladies to be less fearful of volunteering to arrange a pedestal at weddings and festivals. It was well attended. Four ladies will be retiring in 2011 for various reasons and have been thanked for their contribution over the past years. Nobody has come forward at the moment to replace them. Is there anybody who would like to join us in this very rewarding task? May I take this opportunity to thank everybody who so kindly gave donations in memory of loved ones towards the purchase of Easter lilies? The church and porch, as always, looked magnificent at Easter and I wish to thank all those who helped to make it so, especially Lindsey McGowan who worships at St Nicolas’. She always oversees the lilies and is leader of the team. The Easter Story displayed in the flowers under the Altar table is quite beautiful and is maintained diligently until Pentecost. Thank you Helen Mann for this. Thank you to all the St Mary’s flower arrangers who gave their time and talent on Holy Saturday to provide our wonderful Easter flower display. This adds another dimension to glorifying God in our Easter worship. The next Special Occasion will be the festival of Pentecost on 12th June, and we will again be collecting money towards the cost of the flowers. Please do give generously. We would be very pleased to hear from anyone who would like to comment on the flowers, or to volunteer to help, either regularly as part of the group or on an occasional basis. Please contact Sheila Beer, Lindsey McGowan or Margaret Waker for more information. At St Nicolas’ we celebrated the ongoing work of Christian Aid and the launch of its special week for 2011 at our Eucharist With A Difference on Sunday 15th May, at which we were joined by members of the St Nicolas’ Brownies (photograph right). We focussed on the film, Out Of Poverty, which illustrates how Christian Aid transforms communities. We saw how, with support from Christian Aid, coffee-farming communities from Nicaragua are working their way out of poverty, running successful co-operatives and providing educational opportunities for the young. 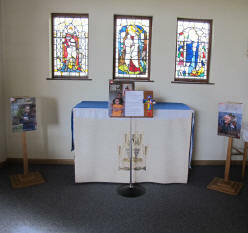 In the context of this film and the Gospel reading of the day, the Shepherd and His sheep, we moved amongst five prayer stations (photographs below). These invited us to relate to the lives of those in poverty, to reflect and to see a way in which we can promote justice and to work towards a fairer world. Collectors (photograph right) were commissioned to set about their task in the following week and to contribute to the work of Christian Aid, whose aim is to ‘help people in poverty out of poverty’. This is the highlight of Christian Aid’s fund raising year. 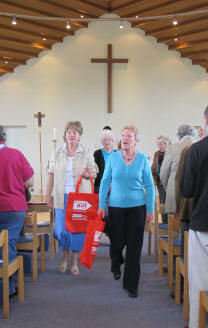 The week’s activity produces a large proportion of Christian Aid funds for the year, so we in this parish aim to provide collectors for as much of the parish as possible. Thank you to our regular collectors who have, over the years, given of their time and determination, and also to those who have volunteered this year for the first time. We covered all but two roads, a larger area than last year. We started the year without an organizer for the St Nicolas’ area of the Parish but at almost the last minute Allan Philpot came forward and volunteered. We noted that more than a quarter of the donations were Gift Aided, which means that Christian Aid will be able to claim another £300-£400 on top of the amount we actually collected. Many thanks to all involved in collecting, counting and donating. It has been a great privilege to be part of two great events when young people came together from different churches across Cheltenham. Within a month many of us were meeting together again as we shared a BBQ and sports afternoon at the Pavilion on Hatherley Lane – the base of Christian City Church (C3) Cheltenham. The early rain passed and Ultimate Frisbee, Rounders and Volleyball followed as well as a real feast of food. A highlight had to be PPY beating ‘the rest’ at Ultimate Frisbee (all that practice paid off…). More exciting, though, were those links building between young people and leaders from across town. There is a strong sense of youth workers and young people growing in their commitment to each other and to the work God is doing and longing to do across Cheltenham. Please do pray that we would all have the courage to step out of our comfort zones to be genuine bringers of God’s hope across the town. In early March we flew to Manaus, which is the capital of the state of Amazonia in Brazil. It used to be a very busy city about a hundred years ago, when the rubber trade was at its height. As a result of this it has many imposing buildings which include the Opera House, which has cast iron seats imported from Scotland and beautiful French drapes! The Central market is made in the same style as the Eiffel tower, but that is where the similarities end, as the market overflows with stalls of every description and is packed with people selling things, people buying stuff, tourists, beggars and dogs. Most of the people from the outlying areas go there to sell their produce (various fruits, vegetables, manioc flour and jewellery made from seeds or wood) which is their livelihood. There is also a busy port area with many boats and people coming and going all day. There are river buses, river taxis as well as floating ‘supermarkets’ and petrol stations, all so colourful and smelly!! We joined a very small cruise type boat with only sixteen passenger cabins and travelled on it for a week. It was an amazing trip and quite energetic, as we were woken at 5.30 most mornings and taken out in large canoes to see the birds as they awoke, before coming back for breakfast and then progressing through each day with several other outings, usually to go fishing, visit native villages or, on one occasion, for a walk through the jungle (in the rain!!). One of the unforgettable early morning adventures was to go and feed the dolphins. Yes, there are dolphins in the Amazon River, we had got glimpses of them from the canoes each day, but this was different! One family of river dwellers had been given permission by the authorities to feed the dolphins, because their numbers had been reducing as river traffic increased. 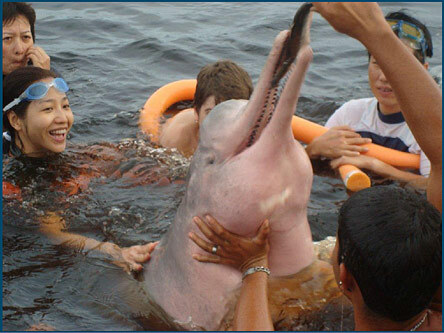 The money we paid for the privilege of watching them being fed paid for the dolphins’ food. Some people have doubts about the ecological rights and wrongs of this, but it was still an incredible experience. It was another early start and we went prepared to swim in the dark murky waters (a bit scary!!). There was a step out onto an underwater platform (so you didn’t step in the mud) and then we waited as the boys (holding fishes) slapped the water. The next moment we sensed rather than saw dolphins approaching. As the boys held the fish up out of the water, the dolphins raised themselves out of the water amongst us! So close that we all had a chance to touch, to stroke and generally marvel at the sight, colour and size of these large mammals with skin that was soft and smooth, a bit like velvet. There were several, including one female with a baby and another that was pregnant. Most of them were pink in colour! Eventually when it became obvious that there was no more food to be had, they swam away, leaving us standing in the water wanting to see the ‘show’ all over again! Truly spectacular! A huge thank you to Gillian Jackson, who has retired from being coordinator of refreshments for ‘Gold Cup Parking’ at St Nicolas’ after many years. Gillian has now handed it over to the able hands of Sue Bolton. Everyone loves a good story, especially children, and many of the best stories are to be found in the Bible. Each week a couple of dozen of us from various local churches take turns to visit St Mary’s Infant School, Oakwood School and Swindon Village School and read aloud a story as part of the school assembly. For many of the children this will be the first time they have heard some of these stories and we think this is invaluable ministry. Our stories are found in The Lion Storyteller Bible, written by Bob Hartman in a simple language suitable for reading aloud to young children. About four or five of us will visit and we each take on the part of one of the characters in the story of the week. We try to engage the children whenever possible and invite some of them to join in the acting. To add impact we may dress in ‘biblical’ costumes and use simple props, relying heavily on the children’s imagination. If you think you could spare a couple of hours once a month or so, we would love to hear from you. We are looking for about three extra people to take a turn now and again. If standing in front of young children is not for you, how about turning some old sheets or curtains into costumes for adults and children to wear? Please have a word with Jean Axton, Sheila Beer, Diane French, Avril Keen, Sylvia McKenzie, Jenny Newman, Nigel Woodcock or me. If we approach this passage using Lectio Divina, as we did in the Lent groups, I wonder which words might strike us as particularly meaningful. Read the passage slowly – it is only four verses – and then think about it for a couple of minutes. I like ‘compassion’ and ‘harvest is plentiful’. Or perhaps I might choose ‘teaching’, ‘preaching’, healing’. ‘Disease and sickness’ may be relevant for another person, or ‘harassed and helpless’. ‘Sheep’, ‘workers’, ‘good news’. Read the passage carefully again, and pause again. Why did I choose these words? Sometimes I do feel harassed, particularly when I have too little time left for all the things I need to do. And I feel helpless because I can’t seem to sort it out. Jesus had compassion on people like that. Sickness: we all fall ill sometimes; some recover quickly, while for others things are not so good. Healing: natural, miraculous, with expert help of doctors. Jesus healed. Plentiful: a lovely word, especially if we like what there is plenty of! Harvest: fields, food, ripeness, maturity. Gradually our meditating on this passage evolves into discussion. Did Jesus really heal every imaginable disease or sickness? Does he still heal today? Where was he teaching? In the churches of his day. What was he preaching? The good news of the kingdom – whose kingdom? Is this what we are preaching and teaching in our churches today? What about the image of sheep without a shepherd? We don’t see many shepherds, but I am sure we have all come across sheep somewhere, running first in one direction, then another, or just freezing on the spot. Walking along a hilly coast path recently I noticed a few sheep between me and the edge of the cliff with its sheer drop into the sea. Rather than continue at the same pace and risk frightening them into running in the wrong direction, I slowed to give them time to move ahead of me and eventually cross in front of me away from the sea. Jesus saw the people as leaderless, like those sheep, and he ‘had compassion’ on them. The phrase ‘sheep without a shepherd’ would have been familiar to his hearers from their reading of Scripture (cf Numbers 27:17; Ezekiel 34:5). The last image in this passage is that of a plentiful harvest, ready to be gathered in. What harvest is Jesus talking about? Is it the people around him ready to hear God’s word? Waiting to find a reason to change their lives? People who heard about God years earlier, maybe as schoolchildren, and now as adults are trying to make sense of it? And who are the workers? Jesus says to ask God to send more workers into his fields. Does he mean you and me? A Sung Eucharist for the whole North Cheltenham Team Ministry to celebrate the Feast of the Ascension. The Bishop of Gloucester will preside and preach in St Mary’s at 7.30pm and the service will be followed by ‘wine and nibbles’. Do come and welcome Bishop Michael and join with friends from across our Team Ministry. ‘Roots’ (Encouraging one another in faith) is holding a Picnic Lunch on Sunday 5th June at 12.30pm in Pittville Park (we’ll meet opposite the play area). All welcome. Trinity Sunday is one of the services in the year when we try to make things a little more accessible for children and newcomers and is a great opportunity to invite people to come to church. If you would like to be involved in the service, do come to the planning meeting on Thursday 9th June at 7.30pm at Prestbury Vicarage, Tatchley Lane. Please come to one of these excellent sessions so we can offer the best possible invitation and welcome to everyone. Thank you to all who supported last month’s stall, both baking and buying. We were able to send £40 to Christian Aid. Well done everybody! This month’s stall is on Sunday 19th June and we invite the A-F team to supply the cakes. If you would like to join our baking teams, please have a word with one of us. On the day when we give thanks for the gift of the Eucharist, we will join with friends from across the North Cheltenham Team Ministry at All Saints’ Church for a Sung Eucharist and procession of the Blessed Sacrament. 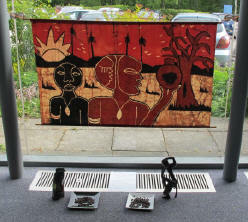 On Saturday 25th June there is an African Fun Day in Gloucester Cathedral from 10am to 3pm. This is a family fun day with activities, stalls, food, and displays that will explain about Mothers’ Union workers in Africa, also artefacts, etc, and also the opportunity to learn about the MU in this country. Worship will be a Celebration with African flavour. Cheltenham Deanery is responsible for the Bathroom Stall, and there are boxes in St Mary’s and St Nicolas’ churches to receive bathroom items and toiletries that will be most gratefully received. The Prestbury Mothers’ Union next meets on Tuesday 28th June at St Nicolas’ Church at 7.30pm, when our speaker will be Julie Jefferies. She is coming to explain ‘Open the Book’, a marvellous service provided by a good number from our congregations who go into various local schools and tell and act Bible stories for the children. Everyone most welcome. The Churches Amateur Dramatic Society (CHADS) has started meeting again on Fridays at St Nicolas’ Church Room at 7pm. Newcomers are most welcome; fresh ideas are always a must. We are looking to do our next production on 14th and 15th October. 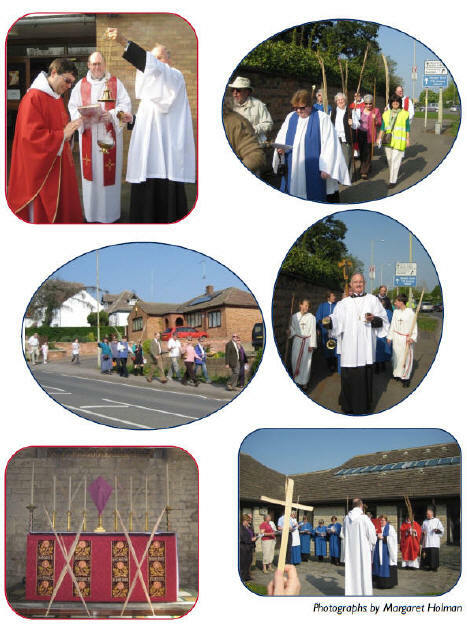 A North Cheltenham Team Pilgrimage to the Shrine of our Lady of Walsingham is being planned for the May Day Bank Holiday Weekend 2012, from Friday 4th May until Monday 7th May. To secure one of the 20 places booked, please send me a deposit of £10 (non-returnable) as soon as possible. (A further deposit of £20 per person will be required 12 weeks in advance of our pilgrimage.) If anyone would like to know more about Walsingham (the shrine, accommodation, sample programme, transport, cost), please contact me. Booking forms and more details will be available later in the year.